This week, InterExchange participants from the Philippines attended a tour of the iconic New York Public Library's main building located in Bryant Park in New York City. 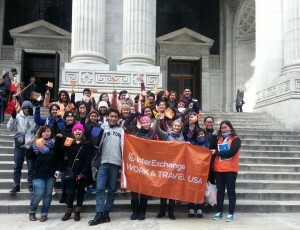 A group of 40 students gathered in front of the building's famous lion statues and posed for a group photo with the signature Work & Travel USA orange flag. The docent-led tour took participants through the library's historic corridors, making stops at exhibits both old and new. Among the well-known exhibits was the first Gutenberg Bible to come to the United States, displayed in the famous Gottesman Exhibition Hall. The hall boasts floor to ceiling murals depicting the evolution of the written word from stone tablet to scripture. In addition to taking in its architectural beauty, students enjoyed learning the library's rich history as a hub of knowledge in New York City for both locals and tourists alike. Special thanks to library docents Pat Darcy and Carol Hekimian for sharing their library knowledge with InterExchange participants and providing an unforgettable cultural experience!